Hillary | Comics I Don't Understand - This site is now being updated daily at http://www.comicsidontunderstand.com. Please change your bookmark if necessary, and notify any web site with a link to the old address. Does this refer to anything in particular, or is it just a very generic politician joke? This “Hillary” politician has a reputation for her expert evasion of clearly answering any questions, and reworking the answer to address her own talking points instead. Yes, every politician has some amount of skill at this (and some could use more), but “Hillary’s” skill is so highly refined it’s noteworthy. That hasn’t been my impression. it’s a dittohead, and not very funny. But then they hardly ever are. I think the joke is that even kids are frustrated that she did not give a yes or no answer. But the question came during the ill-conceived “Lightning Round” and she actually made an attempt to frame her answer in context. Pretty hard to do in 30 seconds. Lightning round? In a presidential debate? That’s not a debate, that’s a game show! Hillary had been dancing around the question of her support for the authorization of the war and what she would do now. I suspect the child is as frustrated as I am at the politician two step. I got the impression that it was a humorless attempt to reference the illegal immigration answer. 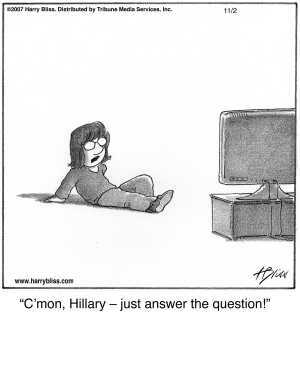 At the last Democratic “debate”, Hillary Clinton contradicted herself so often, and so avoided straight answers to straight questions, that even other candidates made comments amounting to “c’mon Hillary – just answer the question!” John Edwards just released a commercial showing Hillary’s confusing & contradicting responses. Democratic support has dropped based on it, and major left-leaning pundits have reduced her odds of winning. …and all that is _without_ “dittohead” commentary. That’s because everyone seems to want politicians that lack nuanced views on anything. For some reason, Kerry’s nuanced views became “wishy-washy” and now Clinton’s nuanced views become “triangulation”. What the freaking hell? Do we want intelligent politicians in office, or do we want ideologues who can’t see both sides of any issue? Powers — I would LOVE to support Hillary whole heartedly, but she makes it hard to do so. I do want a politician to see all sides of an issue — I certainly have had enough of the the other kind, but I also want a politician who is clear about where they stand on an issue. It is one thing to say “I understand your position, but disagree with it because …..” , it is another thing to be evasive when answering a question. I am afraid Hillary has been doing the latter. There’s a difference between “nuanced position” and “not answering the question”. The latter is funny. Oh, man! Even the people running against her criticized her? Wow! Her answers must have been pretty bad if even those debating against her attacked her. That’s pretty rude of them. A debate is no place for an argument. The reason politicians are evasive is because people take their stated words and twist them to mean something they didn’t mean. I can’t really blame them for not wanting to fall into that trap. The way to avoid that trap is to be straightforward, say what you mean and then stand behind what you say with logical reasons.